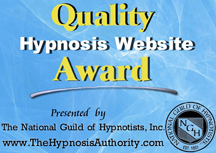 Offering you a powerful, life-changing transformation for body and mind through the use of hypnosis. To help you evaluate if my voice and style is right for you, right-click here and choose something like (Save Link As) to download a free 13 minute relaxation MP3 audio (12.2 MB). Do not listen to this audio while driving or operating machinery. Right-click here and choose (Save Link As) to download the related free WMA video (203.8 MB), or listen on YouTube. To view an online version of my Client Bill of Rights, click either HTML version (for online viewing) or CLIENT_BILL_OF_RIGHTS version (best for printing).